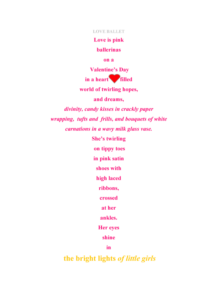 The Ballerina concrete poem is archetypal, a symbol, one of a series of images. As I created the poems, sorting words like seeds to produce images, often with rhyme and meter, unconscious energy beyond the personal unconscious found a way into the process, and actually became the process. C. G. Jung refers to the process as individuation—a process that enlightens like dreams, but in this case, the poetry-images can be categorized as “fantasy-images.” They reflect my personal experience of archetypes, and at the same time, they contain content that is numinous, originating beyond conscious awareness. The archetypal content exists because the effort, the process, was happening without conscious effort, and the effort provided a synthesis of both image and affect (words). The Ballerina contains much symbolism, most of it unintended. One and Many: Little Girls Speak Volumes points to the process as much as the image. One has much to say about many. Like most encounters with Jungian archetypes, “The Ballerina” dances the dance of individuation and tells the tale of transformation. We begin with the notion that our psychic economy consists of both conscious and unconscious content; accepting that what is unconscious is unknown to us. It is the confrontation between what is unknown and what becomes known via the unconscious that leads us to posit that the unconscious interacts, or languages, to promote conscious awareness for outcomes that are potentially healthy, beneficial, and enlightening. As we experience dreams and “fantasy-images” like hazy jewels of indispensable knowledge, we are beset (like it or not) with the language of metaphors, symbols, and archetypes. It is always the subject of my work with archetypes to address that such a language exists, having personally experienced the image-making process, the anonymity, the mystery, and indeed, the magic. “If unconscious processes exist at all, they must surely belong to the totality of the individual, even though they are not components of the conscious ego” (Jung, 1969, pg. 275). The archetypes that manifested through my awakening process are genuine artifacts, resembling and affirming Jung’s painstakingly precise definitions. For instance, “In all these states the check put upon unconscious contents by the concentration of the conscious mind ceases, so that the hitherto unconscious material streams, as though from opened side-sluices, into the field of consciousness. This mode of origination is the general rule” (Jung, 1969, p. 155). “This is the way the unconscious works, by symbolical analogy” (Edinger, 1972, pg. 100). “An archetypal content expresses itself, first and foremost, in metaphors” (Jung, 1969, pg. 157). “If unity, singleness, and indivisibility are the hallmarks of individuality, multiplicity and dispersal are its opposites. This opposition is exemplified in the traditional philosophical problem of the one and the many” (Edinger, 1972, pg. 172). 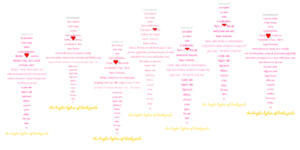 The Ballerina Poem is in the shape of a little girl; I began the process by centering a linear, block style poem. Notice a little ballerina in a tutu, all set for a performance on Valentine’s Day. She is the epitome of pink, perfection, divinity, and she is Love personified. The words of the poem, for instance, “divinity, candy kisses in crackly paper wrapping, tufts and frills, and bouquets of white carnations in a wavy milk glass vase,” were chosen to materialize a tutu. As with any poem, especially one that is limited to words fitted into a shape, this particular poem seemed to defy all of my attempts to fashion the words into place, especially as I worked with the heart. It is interesting to note that the heart is an energy center of the body, one associated with nurturance (pg. 377 VM). I interpreted that I needed to focus more on nurturing myself than over-functioning for others. “Even when a symbol has a collective or universal meaning, it still has a personal coloration for you and can be fully explained only from within you” (Johnson, 1986, pg. 63). “The levels at which healing may take place can vary from a purely physical healing at the physical/etheric level to the spiritual levels where the Higher Self is already attempting to integrate with the physical body and personality” (Gerber, M.D., 2001, pg. 322). We may look for undercurrents of transformational and healing energy connected to the autonomous aspect of the image-making process, the process of individuation. Archetypal images originate in the unconscious and reflect the energy of the unconscious (Self, Source). Notice how energies dance throughout archetypal imagery, symbolically, physically (“Pirouette”), or they are otherwise implied. Such energies include centering, balance, and spinning, for instance. Spinning is symbolic, a kind of universal energy, such as Kundalini, Gandhi and the spinning wheel, as well as Biblical and fictional whirlwinds associated with change. There is circumambulation; a “walk around” attached to the nonlinear process, a circling exchange between the conscious and unconscious. 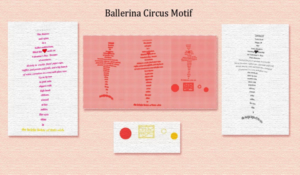 The ballerina image contains axis symbolism, as well, both a vertical plane (the ballerina) and a horizontal plane (the lighted floor). The planes are connected by the word “in” found on the tip of the “toe shoe.” Symbolically, and as the process would have it, it is where inner and outer worlds unite. Interestingly, Jung writes, “in-dividual” (Jung, 1969, pg. 275), isolating the word “in” for its significance. Almost every religion has an “Axis Mundi,” a place where earth and sky unite. Note the ego-Self axis, as well, which shifts when ego is decentralized from the personality. According to E. Edinger, “The ego becomes aware, experientially, of a transpersonal center to which the ego is subordinate” (Edinger, 1972, pg.69). And according to Jung, “The symbols of the process of individuation that appear in dreams are images of an archetypal nature which depict the centralizing process or the production of a new centre of personality” (Jung, 1974, pg. 115). 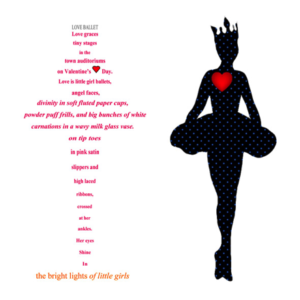 One very enlightening aspect of the Ballerina poem is its One-Sidedness. “Just as all archetypes have a positive, favorable, bright side that points upwards, so also they have one that points downwards, partly negative and unfavorable, partly chthonic, but for the rest merely neutral. To this, the spirit archetype is no exception” (Jung, 1969, pg. 226). It was sometime in early 2000 when I produced the concrete poems. I can definitively say that “back then,” I wasn’t consciously aware that the poems, themselves, were symbols. I had no intentions of using them for a purpose. Once I understood their nature and began to amplify the images, it was the color pink that dressed the ballerina image and the ruffle of feminine energy that showed the way. As a little girl with two sisters close in age, my mother often dressed us in pastel-colored dresses (I chose pink). My mother was a talented seamstress so the dresses were lovely, sweet. I remember one dress made of dotted Swiss with ribbons that crossed in the front with a bow in the back. It was pink, probably an Easter dress. I was everything that my attachment to the color pink would have suggested I should be—that was then. Pink meant soft and sweet, “sugar and spice,” candy sweet like the ballerina. It meant vulnerable, and it suggested that power was not for little girls. No, the personal power that disappeared within had to be projected on someone outside; it had to be projected on a man, and then, my power had to be sought from outside of myself. The ballerina poem is a projection, and I saw myself projected in a way that exposed my lopsided thinking, and importantly, in a way that allowed me to assimilate the information. “How the harmonizing of conscious and unconscious data is to be undertaken cannot be indicated in the form of a recipe. It is an irrational life-process which expresses itself in definite symbols” (Jung, 1969, pg. 289). Women, in general, identify with the color pink. How pink is changing the world for women is a fascinating study in itself. Pink, as though personified, is making countless conscious and collectively unconscious statements, promoting empowering thoughts and behaviors. The Rock Star, PINK, empowers women by making “outspokenness” more socially acceptable. Victoria’s Secret, Pink, empowers women to be comfortable with their sexuality. 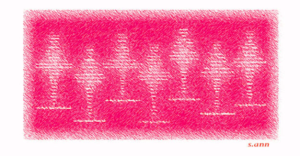 The cancer support Pink Ribbon is a symbol of unity that balances competitiveness. It is interesting to note, on an ongoing basis, the many emotions associated with the color pink. 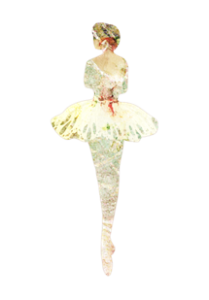 The ballerina, like other such images, can be modulated into a variety of “motifs” adding dimension without actually changing the core image. “For the modern man, a conscious encounter with the autonomous archetypal psyche is equivalent to the discovery of God” (Edinger, 1972, pg. 104). The ballerina image appears as a Divine Child Archetype, a symbol of perfect unity with God, original wellness, and wholeness. 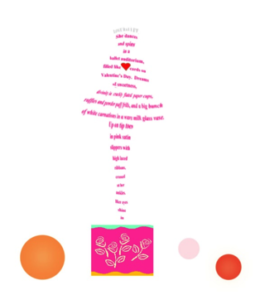 The ballerina poem supports the belief that divine essence is, as it should be, love. Divine nature cannot be altered or taken away. It is a sacred gift that belongs separately and collectively to each individual, a gift to be sought and nurtured. The ballerina poem was originally called, “Love Ballet.” A Bible verse that comes to mind affirming that Love is the essence of Divine Being is— “God is Love” (1 John 4:7-8). The images are malleable to just about any art style. 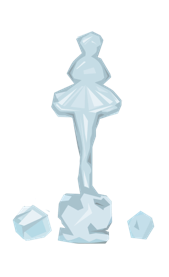 The Ballerina “Frozen” motif symbolizes obstruction and immobility. “Authenticity is an ‘owning’ of all experiences, including emotions and thoughts that are not socially acceptable. Because self-esteem is based on the acceptance of all thoughts and feelings as one’s own, girls lose confidence as they stop expressing certain thoughts and feelings” (Piper, PH. D., 1994, pg. 38). “The rules for girls are confusing and the deck is stacked against them, but they soon learn that this is the only game in town” (Piper, PH. D., 1994, pg. 39). Mary Pipher’s focus is, almost exclusively, on teenage girls as she discusses the difficulties that adolescent girls experience with identity. In fact, the adolescence issue is the premise of her book, Reviving Ophelia. I love the book, but I believe that what is prescribed for women, in general, is prescribed for little girls. It may not be as apparent in younger children, but belief systems are instituted and assimilated in some way. Pipher supports Alice Miller’s viewpoint as put forward in The Drama of the Gifted Child, distinguishing between parental influences that affect children and cultural influences that affect adolescents. “Alice Miller was an expert on the sacrifice of wholeness. In The Drama of the Gifted Child, she describes how some of her patients lost their true selves in early childhood” (Piper, PH. D., 1994, pg. 36). “What is unconscious cannot be abolished by proclamation or prohibition. One can, however, develop sensitivity toward recognizing it and begin to experience it consciously, and thus eventually gain control over it” (Miller, 1997, pg. 94). “No one can heal by maintaining or fostering illusion” (Miller, 1997, pg.14). In summation, the ballerina image is one that awakened me personally. I was asleep in a paradigm of pink, starting from early childhood. Such a context promotes weakness and vulnerability. Of course, there are other factors, conscious and unconscious, that disempower us in some of our most important relationships. But the ballerina image provides a starting place, one place to look. Given the archetypal nature of this image, I hope it provides a spark for others, as it did for me. Susan Shepler has always worked with language/writing in one form or another. She has a background in language arts, a BA in English/Spanish and a Masters degree in Counseling. Susan has worked with Jungian archetypes for about 15 years. She produced a series of concrete poems; it was the combination of images, words/emotions, and the nature of the art itself, that set the stage for archetypal content and a series of symbols. The images are fascinating, as elusive as Jung describes. The archetypal content seems to have entered by a metaphorical door, a door left open to the way back. She found a better way to explain the process, and the particular path to awareness —Jung calls it individuation, also, “coming to selfhood” or “self-realization.” Not only does she love the work, she loves to share the art and knowledge about the subject. Edinger, Edward F. (1972). Ego and Archetype. Boston, MA: Shambhala Publications, Inc.
Gerber, M.D., Richard. (2001). Vibrational Medicine: The #1 Handbook of Subtle-Energy Therapies. Rochester, Vermont: Bear & Company. Johnson, R. A. (1986). Inner Work: Using Dreams and Active Imagination for Personal Growth. New York: HarperCollins Publishers. Jung, C. G. (1969). Archetypes and the Collective Unconscious, Collected Works of C. G. Jung. Volume 9 (Part 1), Princeton, N.J.: Princeton University Press. Jung, C. G. (1974). Dreams. Princeton, N.J.: Princeton University Press. Miller, Alice. (1997). The Drama of the Gifted Child: The Search for the True Self. New York: Basic Books. Pipher, PH.D, Mary (1994). Reviving Ophelia, New York: Penguin Group (USA) Inc.